Jens Soering was the son of a German diplomat destined for great things. However that all changed when he met and fell in love with Elizabeth Haysom. It was a mad passionate affair that ended in murder and jail time after Haysom‘s parents ended up dead…only what we thought happened wasn’t what really happened. Engrossing German made documentary is not your typical crime documentary. Normally a film like this breezes by in 90 minutes and hits the high points with recreations and lots of talking heads. Things move along at pace giving us a kind of Cliff Notes version of events. 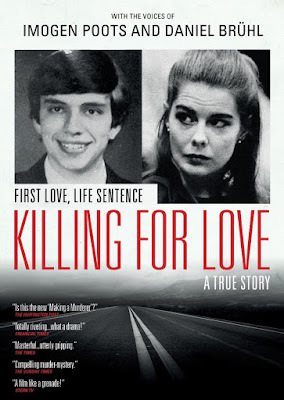 However Killing for Love runs around 125 minutes giving us more time to get into the story thanks to longer interviews and copious amounts of video footage of the trial. The result we are fully up to speed with the case and its twists and turns. One of the two high points of the film is the trial footage which really helps us understand why things went down the way they did. Normally we hear either read back transcripts or are told what was said but in this case we get to hear everyone in their own words and it adds so much to knowing why things happened. Listening to Haysom testify paints a better picture of her actions than if we had been told what that was. Even listening to Imogen Poots read her letters is no match for hearing her own words. The other high point is the long extended interview with Soering who really explains his point of view events. Listening to him speak w understand how he could have ended up going to jail for the woman he loved. Even if the science hadn’t come around to his innocence his words make a persuasive argument. There is no wonder that he has written numerous books and articles while in prison. When I sat down to watch the DVD I groaned at the running time, but once the film was on I was hooked and when I came out the other side I couldn’t believe how fast time flew by. Jonesing for more I put on the extras which is additional interview material. This is a great true crime documentary and is highly recommended when it hits home video on Tuesday.